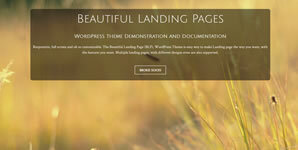 The Beautiful Landing Pages WordPress theme has a history. It’s the WordPress branch of the Coming Soon Responsive Landing Page Project. That project has been around for a while. It was intended to help Web Designers easily and quickly make full screen video (or full screen image) background landing pages. When I first created that project on github, the methodology for making pages like that was actually pretty unknown to a lot of people. It’s pretty commonplace now though. So . . .
Royalty Free videos and images to use for these landing pages! Please check it out at the Beautiful Landing Pages Website that I made just for this theme.